A pen here, a pack of printer paper there – when left unchecked, the cost of office and janitorial supplies for Head Start Programs can quickly get out of control. Think about all the things you have to buy to keep your office running: from printer cartridges to staples, paperclips to basic cleaning supplies, it can all add up before you know it. 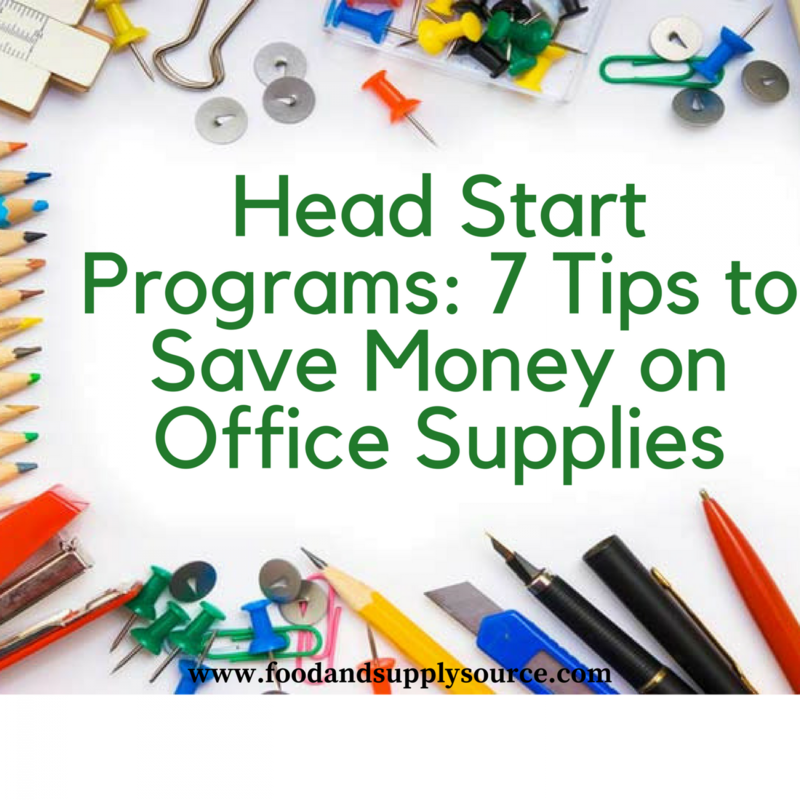 Learning how to save money on office supplies can help Head Start Programs to overcome budgetary issues. Working with a discount supply source can also help you save on janitorial and even food costs to help you realize a 10-35 percent annual savings over your current purchasing strategy. In fact, if you work with SupplySource, our team can even help you reduce administrative costs on accounting, background checks and more. One of the first things that we do at SupplySource when we begin working with a new non-profit human services organization like Head Start Programs, is to conduct a complete audit. Our team of consultants will go over all of your purchases to identify areas where you could save money and reduce administrative costs. Head Start Programs often get into a buying rut where the buy from the same supplier over a period of many years. Unfortunately, they don’t often have the time or the manpower to conduct an audit on their own. That’s why our free services can be so beneficial. Not only do they identify areas of over-spending, but they can also connect administrators with a discount supply source that can help them save money on office supplies, janitorial supplies, administrative costs, food costs and more. One way to reduce costs is to buy generic supplies. When it comes to things like staples, rubber bands, paper clips and copy paper, the generic no-name version is often exactly the same as the brand name option. Our team can help you identify ways to save money on office supplies that will get you the things you need at a fraction of the cost. Buying generic is just one of the many methods that can help you reduce supply costs. This is where SupplySource really shines. We can help our clients enjoy big savings on the supplies that they use all the time, such as toilet paper, copy paper, ink cartridges and more when they buy from our discount supply source vendors in bulk. Head Start Programs often use a set amount of these supplies each year and can really save money on office supplies if they were to buy them in bulk at the beginning of the school year or just a couple of times throughout the year. Having a purchasing plan can also help you to save money on things that you might not need. When you or your staff go to an office store locally, it can become easy to put things you don’t necessarily need in the cart. Colorful markers and pens can be fun, but those items can be brought from home if the staff member really needs them. Basic pens, markers, pencils and other office supplies can easily be listed on a purchasing plan and checked on in the supply closet to make sure that they are available when needed. It is when Head Start Programs divert from the basic supply list that they often over-spend. SupplySource takes care of this part of the equation for you. We work with a wide variety of vendors who have all gone through our vetting system to make sure that they are honest, reliable and offer the best possible prices on the things that our clients need most. We can put you in touch with the discount supply source that will give you the best deals on your office supplies, janitorial supplies and food supplies. We can also negotiate with service providers to help you reduce administrative costs on doing background checks on teachers and other employees, accounting services and more. Offices everywhere are notorious about wasting supplies. Changing ink cartridges before they need to be changed, printing non-office items for personal use or buying things that aren’t really necessary are all examples of waste. Our free management services will help you monitor the use of the supplies in your office so you can save money on office supplies that might otherwise be wasted. We will keep a log of increases in supply use or purchase requests so you can identify problems in your office. Head Start Programs need to be committed to keeping a lid on costs in order to remain within strict budgets. As the administrator of your local Head Start Program you need to lead by example. Show your employees your commitment to keeping spending under control so you can reduce administrative costs and save money on office supplies. When you choose to work with SupplySource, our free program can put you in touch with vendors and other discount supply source services that will help you lower your budget and continue providing the very valuable early education programs to the local community. Contact our team at SupplySource by calling 866-248-4520 or by using the contact form on our website to request more information. We will start with a free analysis of your current spending and ordering process to show you ways that you can save money on office supplies, janitorial supplies, food supplies and even reduce administrative costs within your local Head Start Programs. Give us a call today and get started saving between 10-35 percent on your annual purchasing budget!